For yes, after an extended hiatus to focus on cake and other things (mainly cake) your favourite incompetent podcasters are back doing what they do third or fourth best and talking to London’s finest comedians and getting them to say funny things along with general information about their lives and career. And in this bumper episode (it’s as long as a whole X Files) we ventured to Pattie Brewster’s Friendship Venture at the Camden Head, Camden, to see Pattie’s (Amy Hoggart) sweet but scary attempts to get closer to her audience. 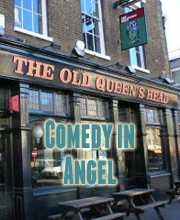 It was a brill night of utter charm and oddness, which you can get a glimpse of this Friday February 10th at Laugh Out London at the Camden Head, where Pattie will be performing along with other odd-shaped balls like Ben Target and Adam Larter. During the course of a lovely evening we managed to chat with Amy’s partner in sketch group Christmas For Two, Sarah Campell, who mainly talked about her Virgin problems. The Gentlemen of Leisure’s Nish Kumar also gave us some more words, including exciting adventures coming up at the Camden Comedy Crawl as well as in the British Museum. It was another welcome return to the podcast too for Matt Highton. Never mention peas around him. And, of course, we chat to the woman behind it all – the lovely Amy Hoggart. Go see the next one. It’s on March 5th at the Camden Head with Max Dickins, Oyster Eyes and Holly Burn. Oooooh.